Oh my I made the kitchen a full on mess yesterday trying to cook Thai pad kee mao, A.K.A drunken noodles! It really shouldn’t have been that hard, but somehow I ended up with a ridiculously smokey kitchen, eyes watering, oil everywhere, burnt garlic scattered about…what to do next time? Have everything 100% ready to go before cooking. No trying to get the peppercorns out of the jar while the fire is going, no peeling the noodles apart while the garlic is burning :-). So here is my recipe for a much easier noodle dish sans mess and full of yummy flavor! 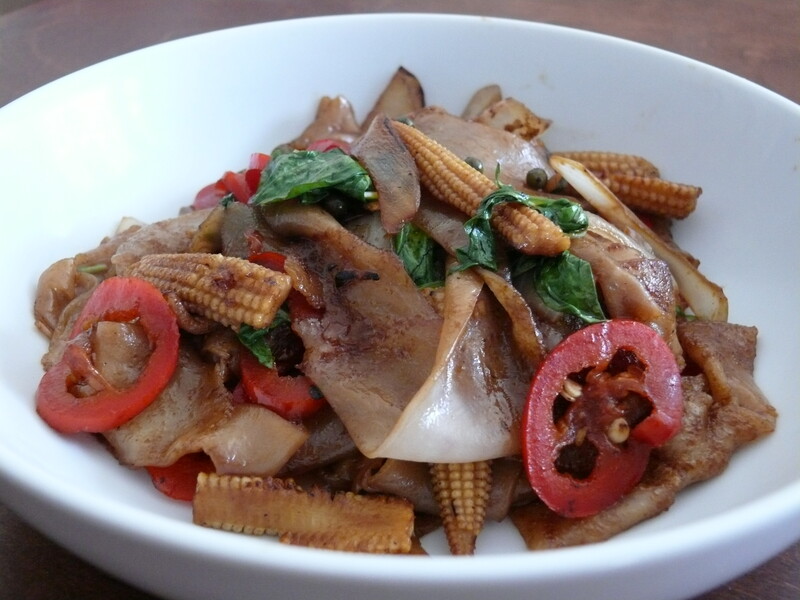 I used two recipes for drunken noodles, this one from Rachel Cooks Thai and this one from Real Thai Recipes. I have to say I fought not to use bell pepper and to keep it authentic at the suggestion of Real Thai Recipes. I’m so used to bell peppers at Thai restaurants in the US, that I think they work well, but to be more authentic I left them out here :-). Unfortunately I didn’t have Thai red chilis or holy basil and substituted red jalepeno and regular basil (still have a growing plant from Trader Joe’s which amazes me!). We loved the noodles none the less! Fresh noodles can be found in Thai markets and sometimes in other Asian markets. On Use Real Butter there is a good picture of the noodles I’m talking about. They are best fresh before refrigerating. As long as you uses them within 24 hours, you don’t need to refrigerate them. The one thing that I think just can’t be accomplished in a home kitchen is that smokiness that the noodles get out a restaurant. Home stoves are just not hot enough! Slice the onion, mince the garlic, take the peppercorns out of the jar if using jarred, slice the red chilis, slice the baby corn. Peel the noodles so that they are all separated. Heat oil in wok on high until hot and smokey. Add the onions and stirfry over high heat for a couple of minutes. Add the garlic, peppercorns, red chilis and baby corn and stirfry until the garlic is golden. Remove from the wok. Add more oil to the wok and get it smoking again. Add the noodles and separate out in the pan. Cook until a little dried out at the edges. Depending on how big your wok is, you might want to do this in two batches. Add back the vegetables, add the basil, pour in the sauce, and mix fully.